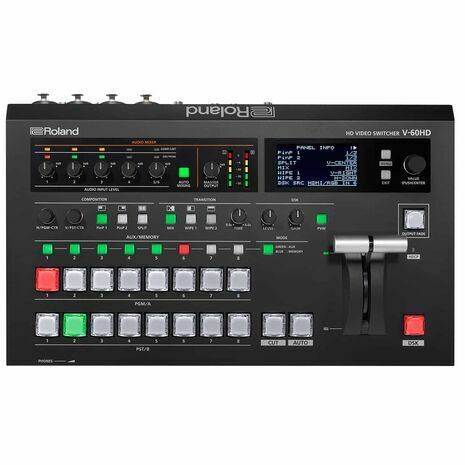 The Roland V-60HD Multi-Format HD Video Switcher is a true multi-format video switcher, meaning it doesn't require input sources to be matched to output resolutions. Suitable for a variety of live venues, including but not limited to corporate, education, house of worship, and theater. The V-60HD enables live switching of HD and computer video formats without requiring external scan converters. It supports up to eight inputs with four SDI, two HDMI, plus two still image files. The HDMI inputs support video and computer resolutions, allowing you mix video and computer graphic formats. Two SDI and two HDMI-assignable outputs support program, preview, and auxiliary busses, allowing you to easily send discreet outputs to separate displays. The HDMI multiview output enables viewing your eight inputs, as well as program and preview, on a single monitor with audio level display. The panel incorporates illuminated buttons that follow red/green PGM/PST color schemes, and a T-bar for manual control of transitions. A built-in 3" LCD screen provides menu access for adjusting the switcher's parameters. Signal processing is 4:2:2 at 8-bits. Effects include a downstream keyer with quick edit knobs for key level and gain control. 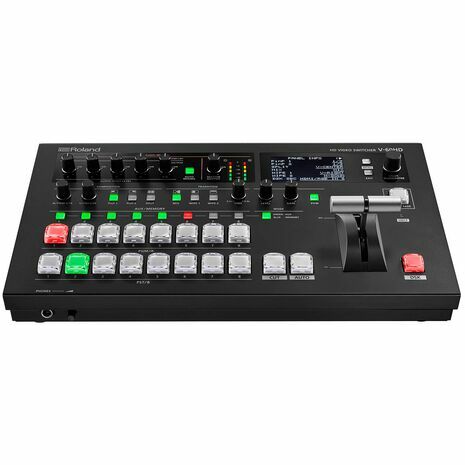 An 18-channel mixer supports inputs from four XLR/1/4" phone combo jacks (supporting phantom power), as well RCA jacks in addition to six channels of audio de-embedded from the incoming video. It features a built-in tally system with GPI in the connector, and supports both RS-232 and Ethernet for control. 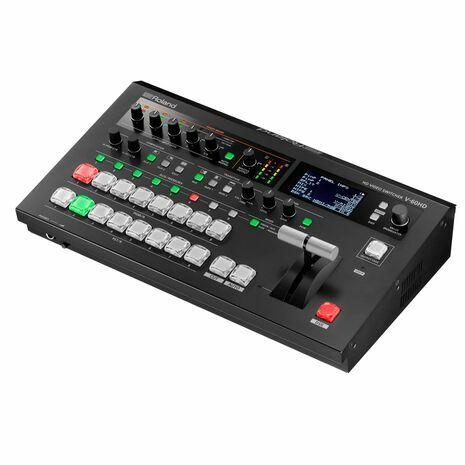 The V-60HD combines the best of live event production and streaming, including SDI inputs for camera sources and scaled HDMI inputs for data, computer, tablet, and other video sources. The switcher incorporates XLR and RCA analog inputs, as well as de-embedded audio from digital SDI or HDMI sources. 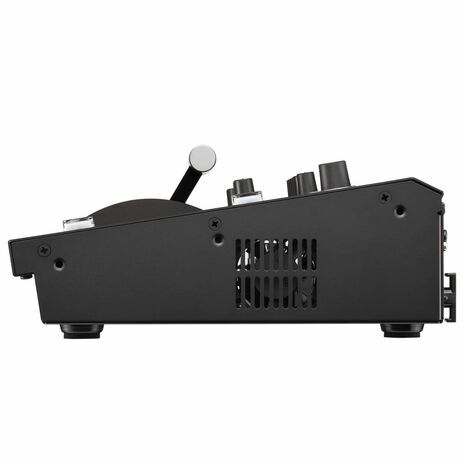 A variety of video connections with a Program and Aux bus makes the V-60HD well suited for a variety of live event production and streaming applications. The V-60HD is portable and small enough to be used in locations that vary in size, from an intimate office to exterior meeting locations. The four SDI inputs and two HDMI inputs enable switching camera and computer sources at the same time for dynamic presentations. The deinterlacer built into the SDI inputs allows you to mix and match 1080i and 1080p SDI sources and multiple cameras without external converters. Using the V-60HD's auto-mixing function enables automatic balancing of audio levels from multiple microphones and video sources, freeing up the operator to focus on switching the video for the event. 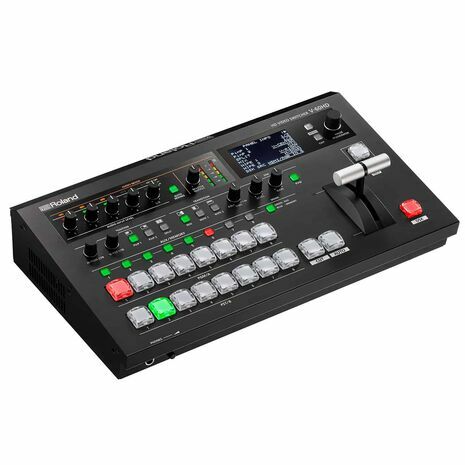 Multi-destination outputs include Program, Preview, and AUX buses, making it easy to send the main output to the primary screen, stream live, and send notes to a presenter's monitor. Audio auto-mixing automatically adjusts audio levels, ensuring even levels for the room mix, presenter, the live stream, or in-room speakers. 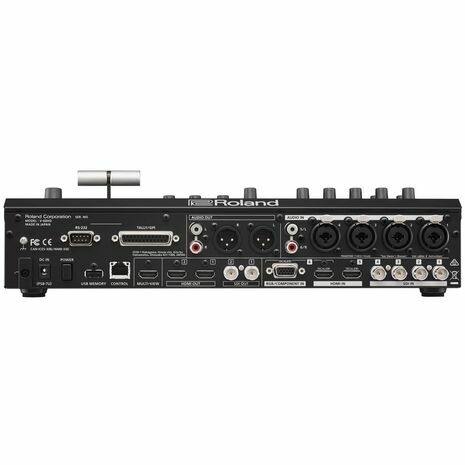 The multichannel audio embed function can be used to record eight discreet audio channels to an SDI video recorder, allowing you to fix audio issues or separate multi-language audio sources later in post. The V-60HD's user interface is easy for novices and can be controlled remotely through the LAN port using Roland's Remote-Control Software for PC or Mac. For fixed installations, the V-60HD functions can be remotely controlled through the RS-232 port. Professional broadcast cross-point buttons with PGM/PST LED color indicators. A rugged T-bar; DSK quick-edit knobs for key level and gain. Two dedicated PiP and Split buttons with knobs for center framing of Split and PiP placement. You can change transition type using either mix or two preset wipe buttons with dedicated transition dissolve time knob. A 3" front-panel LCD display with quick-access menu navigation allows you to adjust switcher parameters. 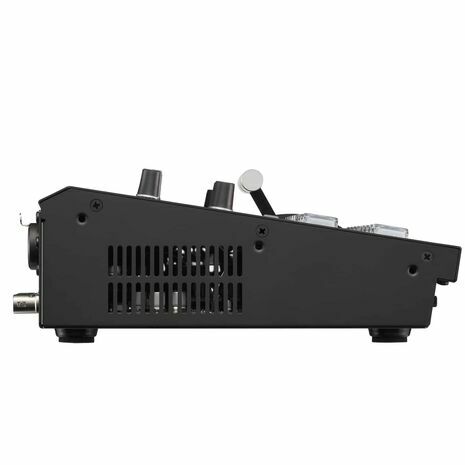 A dedicated AUX bus can be assigned to any of the four discreet SDI or HDMI outputs, providing seamless switching from the eight-input channels (four SDI, two HDMI, or one RGB and two still images). The V-60HD utilizes preamp as well as dynamic effects that include a high-pass filter, gate, compressor, three-band EQ, delay, and ability to select audio-follows-video channel so audio passes through when a specific video source is selected. Dynamics can be adjusted from the onscreen menu or accessed through the Remote-Control Software for Windows or Mac. Assign up to eight analog audio inputs to a separate audio embed channel on SDI 1 and 2 outputs to ensure a separate mix pre-effect (dry) or post effect (wet) for correcting audio problems after the live event. 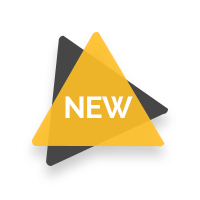 This feature is additionally useful during multi-language events for recording the voice-over or language translation on its own audio channel to a separate master. 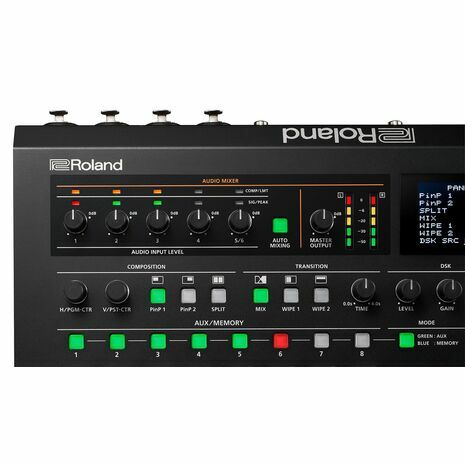 Roland's proprietary wireless tally system uses a wireless LAN router connected to the V-60HD to send tally information to iOS or Android devices on the network. The inputs and outputs support resolutions up to 1080p59.94 (1080p50 for PAL) or 1920 x 1200 computer resolution. Note: Interlaced input signal is converted to progressive by internal processing. The video signal frame rate can be selected at the System Menu (59.94 or 50).